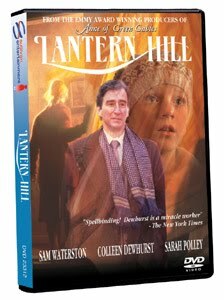 What I didn't tell you at the time I posted that review was that I purchased TWO copies of the Lantern Hill movie so that I could give a copy away. Hello, L.M. Montgomery Reading Challenge! Now is the perfect time. If you would like to win your very own, brand new copy of the Jane of Lantern Hill movie, simply leave a comment below. This contest is open to U.S. AND Canadian residents and will remain open through Thursday, January 20th. I will announce the winner next Friday at the opening of yet another Montgomery-related contest. The only thing I ask in relation to this contest if that you enter for yourself and your immediate family ONLY. (In other words, no entering for people you think might like it.) I'd like this to go to someone who truly loves Montgomery and would love to just enjoy this movie. Thanks for that! If you are participating in the Lucy Maud Montgomery Reading Challenge and have left me a comment/link saying so, feel free to enter twice! I haven't read the book yet, but yes, I'd like to have the movie. I usually like to read first, but would be happy to just watch for now. You did say it goes along with the story fairly well except the spirit world junk. I haven't read the book yet, but I watched Anne of Green Gables over and over before I read the book. Thanks for the chance to win! I have been a fan of L. M. M. Since visiting PEI when I was 9 and getting a copy of Anne of Green Gables. I did have the Jane of Lantern Hill book, but it was not returned to me when I loaned it out. I would love to see the movie! Yay! I won! I won! I won! I'd love Jane of Lantern Hill, too. (Is it possible for me to win twice?!?) I read the book for the challenge last year, but I still haven't seen the movie. I would love to get this dvd!! I would love to watch the Lantern Hill movie :) *Thanks* for the giveaway! I would love to add this movie to my DVD library!! Thanks for the giveaway opportunity! I did leave a message at the challenge site to let you know we were in on the challenge. Oh! Netflix doesn't have this movie! I would love to own a copy! I would jump at the chance to see this movie. Please enter my name! I'm in the challenge, too!! Please enter me as well and I'm also participating in the reading challenge. I haven't read Jane of Lantern Hill yet, but I would love to add this movie to our collection. And I just put up my Challenge post and left a comment, so this is my second entry. It has been a long time since I saw this film. Please enter me to win.